With us, the Greater Omaha area is yours! From convenient, urban condo living to spacious sub-divisions to sprawling acreages under the sun, the Greater Omaha area has all this and more to offer. All it takes is one conversation with the professionals at Sandi Downing Real Estate and we will help you find the perfect home for you. Downtown Omaha: Home to many business headquarters including ConAgra Foods and Union Pacific Railroad, Downtown Omaha offers a variety of excellent housing options, especially in the form of condos. The Old Market is one of Omaha’s most historic areas, with great dining, boutique shops, and night life. Downtown Omaha is considered to be 20th Street on the west to the Missouri River on the east, and Leavenworth Street on the south to Cuming Street on the north, including NoDo and the Riverfront. Midtown Omaha: Centrally located Midtown Omaha is home to the University of Nebraska at Omaha, Creighton University, University of Nebraska Medical Center, St. Cecilia Cathedral, Mutual of Omaha and much more. Some of Omaha’s most popular and historic neighborhoods are found here including Dundee, Field Club and Country Club. Midtown is considered to be Cuming Street on the north, Center Street on the south, 24th Street on the east, and Saddle Creek Road on the west. North Omaha: Sprawling just north of Downtown Omaha is a collection of some of the oldest neighborhoods in the city, including Bemis Park and Florence. The neighborhood’s historic roots include the site of the Mormon Pioneers’ Winter Quarters and the birthplace of Malcolm X. North Omaha is considered to be Cuming Street on the south, Read Street on the north, 72nd Street to the west, and East Omaha and Carter Lake, Iowa to the east. South Omaha: South Omaha’s roots began with the Union Stockyards, but have since transformed into a culturally diverse area of Omaha. Popular destination spots in South Omaha include the Omaha Henry Doorly Zoo and Aquarium along with the Lauritzen Gardens. South Omaha is considered to be Dodge Street on the north, Harrison Street on the south, the Missouri River on the east, and 72nd Street on the west. Near West Omaha: Near West Omaha is home to a variety of residential, shopping and commercial areas. 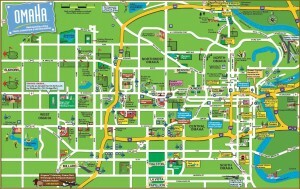 Multiple shopping malls and districts can be found throughout Near West Omaha including Westroads and Regency. Popular neighborhoods in this area include Regency and District 66. Many business offices are nestled throughout, including offices for Blue Cross Blue Shield and HDR. Near West Omaha is considered to be all areas of Omaha west of 72nd Street to I-680. Far West Omaha: Far West Omaha is a sprawling suburban community with plenty of new and custom-built homes. This community is home to the city’s newest hospitals, restaurants and shopping districts with a variety of home styles to meet nearly anyone’s desires. Recently the town of Elkhorn joined Omaha stretching the city limits beyond 204th Street. 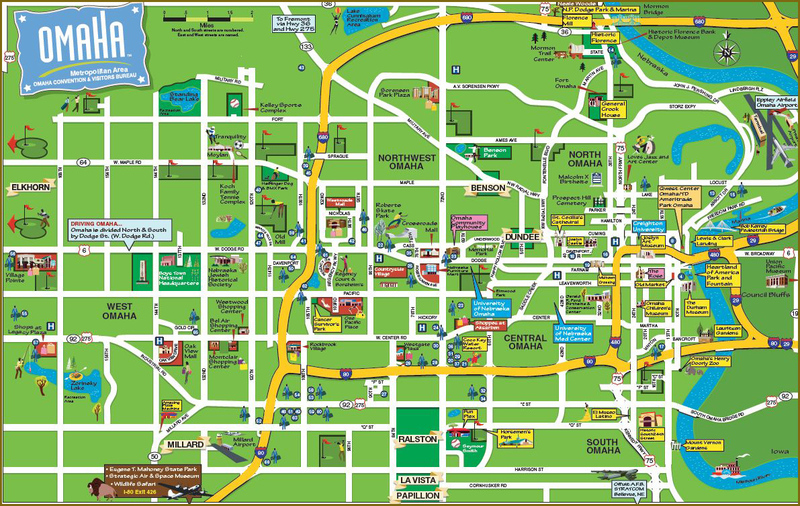 Far West Omaha is considered to be all areas of Omaha west of I-680 through Elkhorn. Papillion, Ralston, La Vista and Bellevue: South of Omaha are four communities with both new and historic roots dating back as far as the 1870s. Those in the military largely populate Bellevue with Offutt Air Force base nearby, while Papillion, La Vista and Ralston include a wide range of family homes from large to small and new to old. Recently the growth in the communities has spawned new shopping districts and golf courses, including Shadow Lake. Papillion, Ralston, La Vista and Bellevue can all be beginning south of L street stretching between the Missouri River and as far west as 96th Street.